How well connected are you?. That's the challenge in todays's mobile, virtual business landscape as companies strive for consistent communications between the employees, business partners, and clients. Too often, a remote working world can feel splintered disconnected, and complicated, resulting in lower productivity - and lost opportunity. 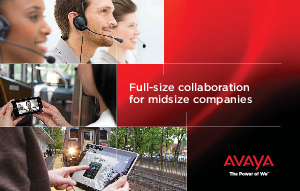 Download this paper to explore the comprehensive collaboration solution for midsize companies provided by Avaya and how this can help engage your workforce and improve customer experience to give you the edge in the market place.